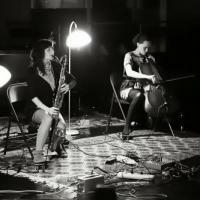 Tune in Live Constructions this Sunday, January 4th at 10PM to hear a live in-studio set by Lea Bertucci (bass clarinet) and Leila Bordreuil (cello). They have been performing together as a duo for several years, and they are preparing for the first performance of Lea Bertucci's residency at Issue Project Room (this Thursday, at 8PM). The pair will be coming to our studio for a live set of original music, followed by an interview. Listen!